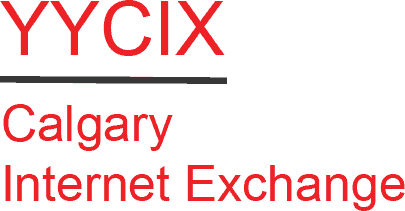 The YYCIX Internet Exchange Community is an Internet exchange point (IXP) in Calgary, Alberta, Canada. It is the first IXP in Alberta. It allows traffic between members to stay within the Canadian jurisdiction, optimising the performance and economy of traffic flows, while limiting the potential for extra-legal surveillance. YYCIX is neutral and independent with no mandatory fees and is supported entirely through voluntary donations. Benefiting Alberta's Internet community; Providing, on a not-for-profit basis, an electronic infrastructure to allow for the exchange of Alberta-based Internet traffic among Alberta-based ISPs (Internet Service Providers), NSPS (Network Service Providers), CSPS (Content Service Providers) and other Internet users; Providing Alberta residents with direct access to local internet content; and Increasing the transfer speed of Internet communications between Alberta companies, friends, neighbours and family members.